Thursday is turning out to be a pretty average day. The paper boy delivered my paper, the trash man came to collect the trash, the sun rose up into the sky, and Pete Doherty was arrested again under suspicion of possessing Class A drugs. Sorry to bore you...............let's hope something juicy happens by this afternoon. Was Pete doing some gardening before he smoked a pound of crack and hit the town? Pasty, white, ghostlike. Yuck. He does look a little like Edie Van Halen in this pix. But alot gayier looking. That is the hand of a CORPSE, about to grab the cigarette. Holy crap anon 5:59 you aren't kidding!!! His hand looks like it belongs to Frankenstein. He's extremities are rotting off!! Is he dead yet??? I keep seeing his picture and thinking it is going to be an obituary. 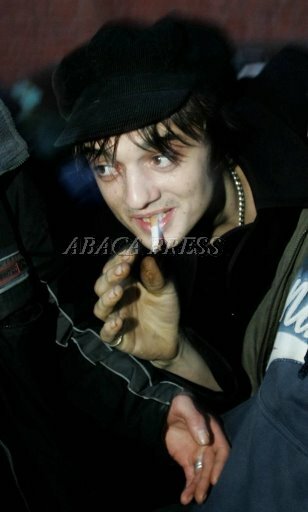 Pete Doherty or Harry Potter, you be the judge. Either way there most definetly some magic substances in that smoking wand of his! Legend is the word that springs to mind. poetic lyrics, libertine lifestyle, what a ture rock and roll star.